Fig. 1. Swedish Columnar Aspen (Populus tremula 'Erecta'). Back entrance of General Services Building, University of Alberta. But before I continue on what puzzles me in this picture, let me quickly introduce you to this species. These trees are known as Swedish Columnar Aspen or scientifically Populus tremula 'Erecta'. Populus tremula is Latin and stands for European aspen. The term in single quotes indicates that these individuals belong to a cultivar named 'Erecta' given its columnar statue. 'Cultivar' is a blending of the words 'cultivated' and 'variety' and represents a product of selective breeding to highlight certain features such as the columnar growth form. Once the desired traits are present, they are preserved by consecutively propagating these individuals asexually, for example using cuttings from stems or roots. Asexual propagation results in genetically identical individuals, which are also known as clones. Due to their columnar statue they make a great choice for small and narrow patches along walls or other space-limited places in urban areas. The cultivar 'Erecta' consists of only male clones to avoid the massive amounts of downy fluff produced by the females each year during summer. The fluff contains the seeds and ensures seed dispersal by wind. It is often heard that people react "allergic" to the fluff, which, however, is incorrect since true allergic reactions are due to the male pollen shed in early spring. Coming back to the photo now, what's odd in this picture? How come that there seems to be a gradient in autumn leaf colouration, i.e. trees to the left are much greener than trees to the right. It also seems that there is a gradient in size although this could be an effect of the slight slope these trees are planted on. My first guess was that the smaller trees to the right are exposed to much more wind and colder temperatures, while the trees to the left are somewhat sheltered from this effect and experiencing their own little microclimate. Furthermore, the big spruce tree to the right might dominate the world below the ground by claiming the majority of the available water for itself. All this could result in an earlier initiation of leaf colouration, or leaf senescence, and less growth for the aspen trees closest to the corner of the building. What are your thoughts? Feel free to comment below! But why do trees shed their leaves anyway? The answer is to escape unfavourable growing conditions. Such conditions can be experienced within the growing season itself (drought, nutrient deficiency, etc. ), or represent the well-known pattern of annual recurring leaf coloration and leaf abscission in autumn to avoid frost damage in winter. Fig. 2. 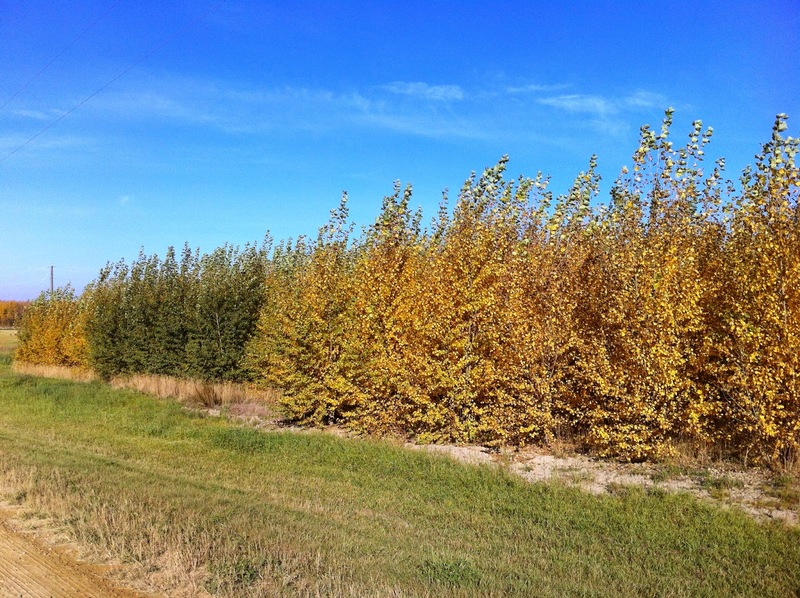 Hybrid poplar plantation by Boyle, Alberta, Canada. All trees are genetically identical, i.e. they belong to the same clone named "Okanese". However, a group of trees in the back doesn't seem to be ready for winter yet and stays green, while the others are already yellow. Intriguing! Any thoughts? Autumn leaf senescence and the onset of cold hardiness represent finely tuned mechanisms, which are mainly driven by day length (photoperiod), and represent a crucial stage in the life of trees. Getting the timing right is important. Shedding leaves too early means missing out on available growing season; shedding leaves too late may result in severe frost damage. The timing of leaf senescence and the onset of cold hardiness prepare trees for the winter season and represent the start of the dormancy period, i.e. the period when trees press the "pause" button with respect to photosynthesis and growth. All life as we know it depends on water and so do trees. When temperatures drop below 0°C water freezes and expands. If trees would remain in a metabolic active state, they would need water-filled cells to function. If you have ever left you beer for too long in the freezer, you know what happens. The same thing applies to plant cells, they burst and the cells die. So what trees do is to either ensure that water won't freeze (supercooling), or to dehydrate their cells for the winter months by moving water into extracellular spaces where expanding ice crystals cannot cause any harm. While supercooling only works up to -40°C, which is the point at which water eventually will turn into ice, trees that employ the dehydration strategy can endure experimental freezing temperatures as low as -196°C (liquid nitrogen). Species that employ the supercooling strategy are mostly found in temperate forests, where as species that dehydrate their cells are found in the boreal forest where temperatures can easily drop below -40°C. Fig. 3. Mid-winter run in Edmonton. Author very frost hardy. But how do trees exit dormancy so that they can produce new leaves in spring? This process is primarily driven by temperature. After trees experienced a required amount of chilling in the winter, which is needed to release dormancy, they start "counting" the number of days above a certain temperature threshold until a needed heat sum is acquired, which then will initiate bud break. Required heat sums are species-specific and under strong genetic control, i.e. trees that were moved across latitudes will still require the same amount of heat sum to which they were adapted to irrespective of their present location. This can have dramatic consequences if a species breaks bud too early in an environment which experiences late spring frosts. We can determine the required heat sum for each species by adding the average daily temperature for days above a defined temperature threshold (e.g. 0°C) starting from a defined point in time (e.g. January 1st) and observing when bud break actually occurs on the studied tree – et voilà! Once the conditions are right (i.e. warm and moist), bud break and the emergence of leaves can progress very fast (see images below). Fig. 4a. Timing of bud break at a hybrid poplar plantation by Boyle, Alberta, Canada. May 13, 2011. Fig. 4b. Timing of bud break at a hybrid poplar plantation by Boyle, Alberta, Canada. May 15, 2011. Fig. 4c. Timing of bud break at a hybrid poplar plantation by Boyle, Alberta, Canada. May 17, 2011. Images: All pictures taken by Stefan Schreiber. Guy, R. D. (2014). The early bud gets to warm. New Phytologist, 202, 7–9. Schreiber S. G., Hamann A, Hacke U. G. & Thomas B. R. (2013). Sixteen years of winter stress: an assessment of cold hardiness, growth performance and survival of hybrid poplar clones at a boreal planting site. Plant Cell & Environment 36, 419–428. Schreiber S. G., Ding C, Hamann A, Hacke U. G., Thomas B. R. & Brouard J.S. (2013). Frost hardiness vs. growth performance in trembling aspen: an experimental test of assisted migration. Journal of Applied Ecology, 50, 939–949. Gan S. & Amasino, R.M. (1997). Making sense of senescence - Molecular genetic regulation and manipulation of leaf senescence. Plant Physiology, 113, 313–319. Burke M., Gusta L., Quamme H., Weiser C. & Li P. (1976). Freezing and injury in plants. Annual Review of Plant Physiology and Plant Molecular Biology, 27, 507–528.